I picked today’s prompt based on the fact that I wasn’t feeling very creative, so instead of a topic/theme it was easier to pick a ‘rule prompt’. The rule was to write a poem with a title made up of two words invented by Shakespeare. The website I used for my word list can be found here. I added my own constraint that each line should be only 4 words long, since I’m trying to get better at being more concise and not overexplaining in my poems. I also ended up using a lot of language from the list in the poem, and have underlined the words in the poem that were Shakespeare-coined. 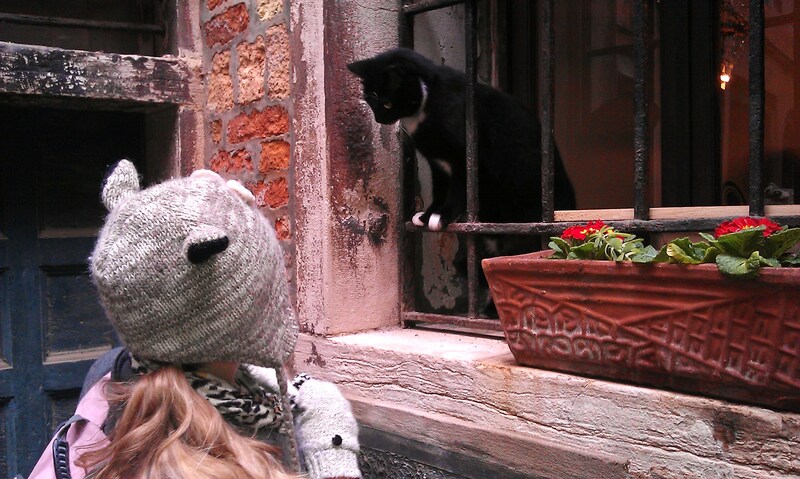 A balcony scene – Venice, Italy, 2013. Here’s a horrible short story I’ve been working on for the past couple of days based on an idea I came up with on a run: what would happen if Shakespeare’s tragedies hadn’t ended as they did? It’s said that “comedy = tragedy + time” but I’m not sure I agree; my idea with this story is more along the lines of “tragedy = romance + time”. I’m sure this kind of ‘fan fiction’ has been done online a hundred times but here is my spin, anyway. One bare foot pressed against the chill stone floor, Juliet kicked back and forth listlessly in her rocking chair and gazed out over the scorched, barren landscape of her Mantua. Though she’d often dreamed of moving closer to the city as the years had passed, her husband had never been convinced that it was safe; they had stayed out here in the dusty outskirts, existing on the little funds that they had been able to sequester on that final night. On evenings like this, sat alone as dusk settled and drew in the horizon, the bareness scared her. Juliet pulled a woollen blanket around her cold shoulders and waited. Romeo was late home again. This time he was drinking and gambling. Most nights were much the same. Although he didn’t like to talk about the details, Juliet knew that her husband supplemented their humble ‘nest egg’ with what he called “satisfying the whims of the fringes of polite society”. Romeo had not lost his penchant for poetry, though Juliet knew that she had long since ceased to be his muse. Drinking and gambling were part of the territory of his work, he had told her. Whether the women that she smelled on his clothes were as fundamental, she was less sure. Romeo’s passions were insatiable and in the end, he had deemed Juliet finite. She should have known. She often tortured herself with these words, knowing how he had pined for other women before her. Knowing how fantastical and insubstantial his love for her had seemed. The moon, indeed! But love is blind and youth is hasty, she reminded herself. Some days, as she sat on the cool stone of their kitchen floor and washed his shirts, she imagined how he spent his days and nights in the city: his head buried in the nape of some young girl’s neck, chasing some impossible satisfaction in the scent of her hair. Other days she dreamed about her nurse. She cursed herself for not taking her advice and marrying Paris. How childish she felt now for dismissing him as boring. The real mistake had been relying on a man alone to stem boredom. Sometimes at night it was Paris’ face that she saw as she drifted into sleep. More often though it was the city itself: the world that he would have allowed her to live in. She remembered the Juliet that she had been then and winced: that fierce Juliet had not seemed destined to be some drunken crook’s wife. She missed the buzz of Verona. The night-time heat of the narrow streets and the pungency of the aromas that floated up from the Adige River; the sordid stories that they allowed her to imagine about the lives of her neighbours. She missed the red hot anger of the rows that she had had with her father, the coolness of the stone floor as she had fled from him and the sweet, soapy scent of her pillow as she flung herself upon it. She missed walking veiled through crowds, anonymous, listening to the cat calls of the market vendors. And she missed the hushed murmurs of the guests at her father’s parties as she descended the grand staircase like royalty, swathed in the finest silks and velvets of the Veneto. “Look at Juliet”, she had heard them whisper. “What a fine woman she is becoming”. Life in Verona had been all about beginnings. Juliet was not sure when her world had ceased to be fresh and new. Now her world was the long, slow suicide of waking and sleeping in Mantua. She awoke, disoriented and still in her chair, to the familiar laughter, chatter and loud crashing of drunken Romeo. He had brought someone back, some other lonely bar fly she supposed. She saw her husband, backlit by the struggling candle she had left burning in the kitchen, fumbling with tankards and a keg. She sighed and half rose from her chair to complain but he was already stumbling towards her, beaming, ready to silence her protestations. “The inn-keeper sold it to me at a very good price Jules and I had good reason: we’re celebrating!” He kissed her forehead roughly and flung a tankard into her hand, ale slopping onto her dress in his fervour. His shaggy beard was glistening with the memory of several pints already drunk. Romeo gestured at the other man and beckoned him towards her. He lit a second lamp and the little living room filled with warm light, revealing the guest’s shy smile. “Juliet”, Benvolio breathed her name reverently, as though in the presence of a spectre. “I said I wouldn’t believe him until I saw for myself.” He stepped closer and took her by both hands, guiding her to stand. In fifteen years, his face had become more lined but his warm eyes and the gentleness of his smile had not faded. Juliet became suddenly bashful of her thin, worn nightdress. He held a hand to her cheek, as Romeo stood grinning, evidently thrilled by the high drama. “You look a little fuller and a little more tired but I still see you in there when I look closely, the beautiful girl that stole our Romeo’s heart.” His voice was warm but his words cut her; Romeo had become inconspicuous through his facial hair and his humble clothes. Time itself had taken care of Juliet’s anonymity. They drank long into the night, until the keg ran out. They had found each other in a bar, it turned out. Benvolio was visiting on business. Romeo repeatedly chastised Benvolio for not visiting sooner; Benvolio laughed uncomfortably and reiterated his fear of punishment. They shared stories of the fifteen years past. Juliet looked for jealously in Romeo’s eyes when Benvolio revealed that he had married Rosaline. “Five beautiful children! The first true union of the Montagues and Capulets!” Juliet felt a pang of jealousy in herself then. Sometimes Romeo would still talk about Rosaline fondly, but it was the children that she had not given him that she knew he pined for the most. Eventually Romeo fell asleep slumped at the table, tankard still in hand. Juliet guided him to bed and returned to the little sitting room, dropping lightly into her rocking chair again. Benvolio’s smile gleamed in the candlelight. “This little room, the candles, the stone walls. It reminds me of the last time I saw you, how we all thought it would be the last time. To look at you then, no one could have convinced me that you’d ever wake up.” She cast her mind back to that long ago night in the tombs; the relief that the plan had worked; the glittering excitement in Romeo’s eyes; Lawrence ushering them nervously through corridors and dark alleys in the dead of night; the only time she had ever ridden astride a horse. It had once been a gilded memory, worn thin by overuse. She found it too painful to dwell on now. “He’s the same but you’ve changed. You look tired Juliet.” He was standing over her and swaying a little, his hand outstretched. She took it and he pulled her to her feet clumsily, landing himself in the rocking chair with her on his lap. Men took to alcohol differently: Romeo was the type to become excited quickly and then slump into lethargy or depression. For other men it was a slow burn to misguided passions. The light of the latter burned in Benvolio’s eyes now, searching for some equivalent light in hers that she felt powerless to offer him. He pulled her towards him and kissed her firmly on the mouth. “What happened to you Benvolio?” She asked, tired. “You used to really care about him. All you wanted was for your friends to be happy.” Her voice was flat, mournful. He looked at her without really looking at her. “What happened to you Juliet? All you used to care about was him.” He kissed her again and she let him, not so much out of desire but out of apathy. The old rocking chair creaked loudly to the rhythms of their bland love making, and Juliet found herself more irritated by the sound than distressed that it might wake Romeo. Benvolio left as the sun began to crack over the horizon, while Romeo lay snoring deeply in the next room. She watched him walk away from her – hurriedly and without turning to wave – and knew that it would be the last she saw of him. Rocking again in her chair, she waited patiently for the sun to rise enough to begin warming the house from the chill that the night had set into its stones. She thought about all the sunrises and all the sunsets and wondered what it would take to make her feel something again as she had done when she was thirteen.